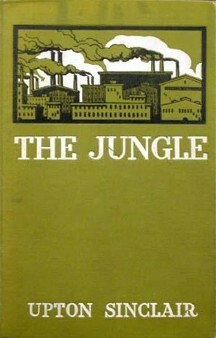 The Jungle is a 1906 novel written by journalist Upton Sinclair. Inspired by the Union Stock Yards in Chicago, Sinclair wrote this book to show the sufferings of the working class and to show the corruption of the American meatpacking industry during the early-20th century. The book writes about the poverty, bad living and working conditions, and sorrow among the working class. The sad state of turn-of-the-century work is placed for the American public to see, suggesting that something needed to be changed to get rid of American "wage slavery". The novel is also an important example of the "muckraking" tradition begun by journalists such as Jacob Riis. Upton Sinclair came to Chicago with hopes of writing The Jungle. When he came to the lobby of the Chicago Transit House, a hotel, he was quoted as saying, "Hello! I'm Upton Sinclair, and I'm here to write the Uncle Tom's Cabin of the Labor Movement!". He rented living quarters and immediately began walking its streets, talking to its people and taking pictures. One Sunday afternoon, he worked his way into a group of Lithuanian immigrants getting together for a wedding party, "Behold, there was the opening scene of my story, a gift from the gods". He was welcomed there and was with them until two in the morning. The Jungle was first published in a series in 1905. "After five rejections", its first edition as a book was published by Doubleday, Page & Company on February 28, 1906, and it became an immediate best seller and has been in print ever since. The main character is Jurgis Rudkus, a Lithuanian man who emigrates to the United States with his fifteen year old fiance Ona Lukoszaite and their extended family. He marries her in Chicago and then soon gets a job at Durham's, a factory in Chicago. The factory mistreats him and Ona and their family. Eventually Ona dies of blood loss because the greedy midwife will not help her because the Rudkus family do not have enough money. Stanislovas, a child in the family who worked in a factory, is killed by an accident while working. Jurgus turns to drinking and Marija Barynczykas, a member of his extended family, becomes a prostitute. ↑ Upton Sinclair, "Is The Jungle true? ", Even if only one tenth of it is, it is enough to make people feel sick.The Independent, May 17, 1906 – as quoted and cited in: Giedrius Subačius (2006), Upton Sinclair: The Lithuanian Jungle. Rodopi, ISBN 90-420-1879-8. This page was last changed on 12 September 2018, at 10:18.